The Carmeuse Calcite float was one of many elaborate creations showcased in the 2018 Nautical City Festival Parade. Rogers City — Thousands lined the downtown streets on a hot Sunday afternoon to catch the Nautical City Festival Parade. 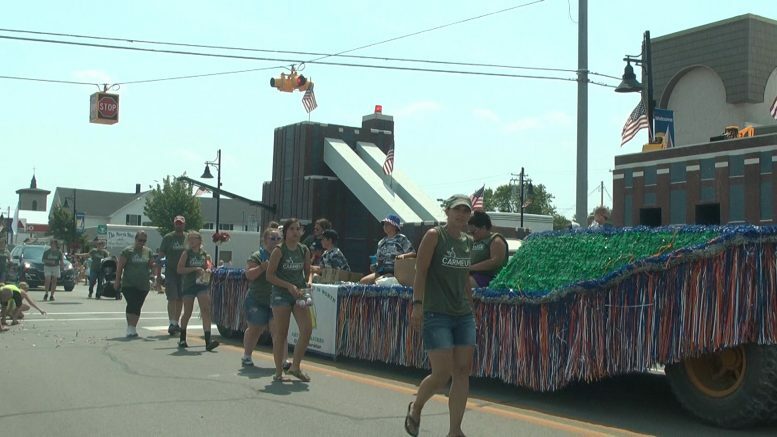 A number of people and floats from Northern Michigan made their way down 3rd Street, showing support for local organizations, politicians, companies, beauty queens, and much more. The ceremony began with a march of veterans and military personnel. Kids flocked to the candy being passed out. Plenty of unique floats and costumes could be seen throughout the whole parade. “It’s simple pride you know it’s like I said, we’re all family here and Rogers City is a wonderful town and we’re all close knit,” said Parade Goer Jodi Lynn Kamyszek. Kamyszek watched her grandchildren participate in this year’s parade. The parade is one of the last events for the Nautical City Festival. Fireworks concluded the week long celebration at 10:00pm.